Niagara Parks has established an enviable record of land stewardship. Our Environmental Mission Statement “improve environmental quality and sustainable development throughout the Parks system for the benefit of visitors, employees and associates” is reflected in our many important preservation and environmental initiatives. Geocaching is an outdoor activity that is similar to a treasure hunt. The goal of the activity is to find hidden containers known as caches or geocaches using a portable satellite navigation device called a Global Positioning System (GPS) receiver. Individuals who practice this activity (generally referred to as cachers or geocachers) place a cache in an outdoor location and post the cache’s latitudinal and longitudinal coordinates on the Internet. Other geocachers then use their GPS devices to download the coordinates and cache descriptions from the Internet in order to find the caches. The majority of Niagara Parks property, which constitutes over 1,700 hectares, does not receive any pesticides. This was achieved through Integrated Pest Management including practices such as careful monitoring, organic alternatives to traditional pesticides as well as using the least toxic and least persistent products available. Pest problems are rarely controlled with preventative pesticide applications but are addressed through an examination and evolution of the need to apply pesticides. Any staff using these products are fully trained and government certified by examination. Our Golf operations are also committed to Integrated Pest Management. Through regular monitoring, invasive cultural practices, the use of alternative control products, new technology fertilizers and a thorough understanding of pest characteristics, pesticide applications are considered a last resort when controlling pest pressures. In addition to this, our legends on the Niagara Facility has achieved full certification in the Audubon Cooperative Sanctuary Program, an award winning education and certification program that helps golf courses protect our environment and preserve the natural heritage of the game of golf. The recycling and composting programs in the Park have long been recognized as a model for parks and other operations across the country. One key initiative is the use of biodegradable plastic and recycling of raincoats at Journey Behind the Falls which welcomes millions of visitors each year. Chipping/composting program for wood debris has been in place for over twenty years at Niagara Parks! This policy has resulted in a large reduction in burning frequency and less air pollution from smoke in addition to more wood chip mulch for use on the grounds. A windrow-composting program for leaves and other organic material was also initiated to augment soil amendment programs for garden beds. In 2001, Niagara Parks entered into a partnership with the Ontario Ministry of the Environment to launch the Spare the Air Emissions Reduction Program. This initiative uses public awareness activities to encourage motor coach and truck drivers to turn off their engines when parked and has resulted in measurable reductions in hazardous air emissions. Since that time, Spare the Air has been expanded to include truck and motor coach drivers operating along the entire length of the Niagara River corridor, with the support and participation of numerous local partners. Each partner distributes educational flyers and posts signs to remind drivers to “Turn off your engine when parked”. The Moraine Management Plan and policies deal with development pressures from the Fallsview Tourist area overlooking Queen Victoria Park. Management, maintenance and rehabilitation will help limit slope instability, control erosion, increase regeneration and assure safe accessibility to the area. Future works on and adjacent to the moraine will be designed to enhance the aesthetic values and native biological diversity of the treed slope. The treed slope or moraine of Queen Victoria Park is of aesthetic and ecological significance. A management plan was created to address problems such as erosion, access, bio-diversity, aesthetics, seepage, maintenance practices and development. Due to the nature of the slope a two-stage evaluation process established to evaluate all work proposed on the Moraine and within adjacent setback zone. Satisfaction of primary goals is required prior to review of secondary goals. Biodiversity: Replace non-native plant species with native one and enhance diversity for wildlife habitat improvement. Aesthetics: Protect and enhance the continuous and contiguous appearance of the slope as natural forest landscape. Slope Stability/Erosion Control: Stabilize soil creep and minimize erosion providing for long-term stability. View Management: Transform the Moraine with plant material so that the visibility of the Horseshoe Falls from important sites is enhanced and improved. Access: Discourage uncontrolled access to and unsafe use of the Moraine providing safe and comfortable alternatives. Seepage: Use excess groundwater to enhance aesthetics and biodiversity of the slope tor. Education/Interpretation: Produce and disseminate materials about the Moraine’s natural and cultural heritage and management. Niagara Parks, Niagara College and the Niagara Peninsula Conservation Authority formed an environmental alliance dedicated to the promotion of a healthy and sustainable environment. This alliance formalizes the existing partnerships between each organization and recognizes their combined efforts in environmental stewardship and protection. Niagara Parks and the Niagara Peninsula Conservation Authority (NPCA) work in partnership to address local water quality concerns stemming from the substantial number of Canada Geese living along the River, specifically near Fort Erie where goose droppings were unsightly and unpleasant and had the potential to pose health concerns. To assist in resolving the problem, NPCA staff maintain a buffer of vegetation along the River to deter the geese from accessing adjacent land. Buffer strips are a proven technology that contribute to water quality improvements by filtering surface runoff and they provide bank stabilization, erosion control and increased habitat for many types of wildlife. Demonstrates an ecologically sound alternative for riparian maintenance. Development of Legends on the Niagara provided educational experiences for Niagara College and Brock University biology students. In association with the Ministry of Natural Resources, students conducted environmental investigations of Ussher’s Creek, including surveying and monitoring of fish, aquatic insects and vegetation habitats. Other programs involving these students have included Niagara Glen, Paradise Grove, Chinquapin Oak Savannah, Botanical Gardens Regeneration Area, Canada Goose Management and Gonder’s Flats. In order to establish the current status of native plants still existing in the Niagara Glen/Whirlpool area, Niagara Parks conducts floral and faunal reconnaissance surveys on an on-going basis. In partnership with Environment Canada, the Ontario Ministry of Natural Resources (MNR) and local naturalist clubs, this undertaking examines location and mapping, particularly of species that are considered at risk in Ontario and Canada. In 1894 over 900 plant species were recorded by Roderick Cameron, an early Niagara Parks Gardener and botanist. By 1943, according to George Hamilton, an instructor and botanist at the Niagara Parks School of Horticulture, “a number of genera of plants cannot be found today” that were recorded in 1894, and many common plants observed in 1894 “can only be found in the more inaccessible places”. In 1993 the “Varga Report” (Steve Varga, a MNR senior biologist) reported only 404 plant species and “sixty-four percent of its historically-present rare plant species have also disappeared”. Locations of many of the rare and endangered species are isolated in scattered sites and others have not been seen in decades. A database of all plant and animal observations/locations is being created, with specific emphasis on Species At Risk (SAR), using GPS field units and GIS technology. Niagara Parks contains 56 kilometres (36 miles) of riparian (shoreline) habitat along the Canadian side of the Niagara River, plus an unspecified length of riparian lands along both sides of many smaller rivers, creeks and man-made watercourses that flow through the Park into the Niagara River. With over 600 individual properties making up the whole of the Park, it is a challenging responsibility to manage all of these shoreline habitats. Elevation differences between the River and surrounding riparian habitats range from a few metres or feet to over 100 metres (300 feet) at Locust Grove Picnic Area at Queenston Heights. Our activities must promote clean water, mitigate stream-side soil or bank erosion, and maintain the integrity and bio-diversity of native plant and animal populations, all while trying to co-exist with a large human population and over 14 million tourists visiting each year. This plan will examine each property in our Natural Heritage Inventory and its riparian habitat, to give managers fingertip information about sensitive environments. The Niagara Glen within the Niagara Gorge is one of the most biologically diverse environments in Ontario and contains many Species at Risk. 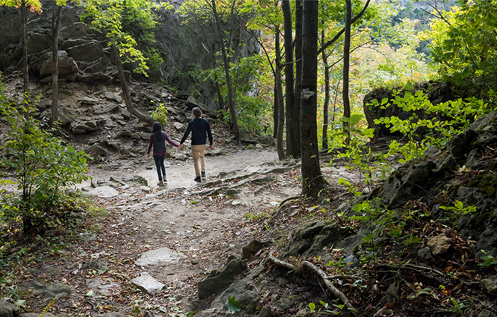 In order to protect this significant natural area, Niagara Parks in partnership with the Ontario Ministry of Natural Resources has developed a Niagara Glen Trail Management System. Implementation of this plan began in the spring of 2003, including trail identification and location, hiking trail improvements, closure of unsanctioned trails, invasive species removal, erosion control and habitat preservation and rehabilitation. These continuing efforts will ensure the maintenance of bio-diversity and integrity of this ecosystem. This project helps to protect the last remaining stand of Chinquapin Oak Savannah that once was the dominant landscape over much of the area. Along the north Niagara River Parkway, the Oak Savannah Project is bounded by the Niagara Gorge, Botanical Gardens, Ontario Power Generating Lands and Sir Adam Beck Generating Stations. Efforts for revitalization of this rare species and related endangered plant species, involved significant removal of invasive exotic species in 1999. This program includes removal of invasive species, reintroduction of traditional native plant species and a long-term management strategy. Paradise Grove is an old forest woodland with cultural and natural heritage significance. Over the years, invasive species have compromised the ecological integrity of the remnant Oak Savannah and Tallgrass Prairie. Parks Canada, The Niagara Parks Commission and other partners are undertaking the ecological restoration of this unique environment. This project will contribute to the long-term protection and enhancement of Paradise Grove for the benefit of citizens and wildlife. Since 1996, Niagara Parks has worked towards the enhancement of Dufferin Islands Nature Area by undertaking initiatives like the planting of new trees and shrubs and undertaking trials of new rehabilitation mulch materials. In 1999 Niagara Parks reclaimed the bus parking area at the brink of the Falls and made arrangements for alternate parking and transportation. Pavement was replaced with green space. The former entrance to Falls Parking Lot was removed and landscaped. Buses now park at Rapidsview Parking Lot and a Call Back System is used to notify the driver when his group is ready to be picked up. In partnership with the Town of Fort Erie and the Peace Bridge Authority, restoration and landscaping was undertaken in the area known as Riverwalk, on the Niagara River Parkway just north of Old Fort Erie. Litter was removed to create gardens and footpaths and breakwalls were created to prevent swimmers from entering the swift and dangerous waters of the Niagara River. The geological nature of the Niagara Escarpment was a major factor in its being declared a World Biosphere Reserve by the United Nations Educational, Scientific and Cultural Organization (UNESCO) on April 4, 1990. The wildlife of the Niagara Escarpment with its wide diversity of birds, mammals, reptiles and amphibians, including a number of rare or endangered species, was a contributing factor to the UNESCO decision. The biosphere concept includes humans as part of an ecosystem. The Niagara Peninsula is considered part of the Carolinian Life Zone. This Zone is actually the northernmost edge of the deciduous forest region in eastern North America and is named after the Carolina states. In Canada the Carolinian Life Zone is just a narrow band across Southern Ontario, that supports the most productive and endangered assortment of plant and animal species in Canada. Species that may be common farther south, are at the northern limit of their distribution, meaning that a high proportion of nationally and provincially rare species are found here. Provincially Significant Area of Natural and Scientific Interest (ANSI). The Niagara River Bedrock Gorge is an Earth Science ANSI because it is the “largest river gorge and most extensive Silurian exposure of its type in Southern Ontario.”Environmentally Sensitive Area (ESA. This is a regional designation reflected in municipal planning policies.